Thotakura Kandi Pappu Podi Pappu. Fresh amaranth leaves are washed and roughly chopped. They are then cooked in oil along with whole spices. Toor dal is boiled till soft but whole and added to the amaranth leaves. Serve amaranth leaves with toor dal over plain steamed rice and dollop of ghee or with roti. Makes: around 4 Servings of Amaranth Leaves with Toor Dal. Separate leaves, wash and roughly chop amaranth leaves. Peel and roughly chop the garlic pods. Make sure toor dal is soft but still holding its shape and looks translucent. Strain the boiled toor dal and keep aside. When urad dal changes color, add green chiles, amaranth leaves and salt. Cook covered on low flame for around 5 – 8 minutes or until amaranth leaves change color and turn soft. Add few splashes of water if the leaves start sticking to bottom of the pan and cook covered again till done. Then add boiled toor dal, turmeric powder and stir fry for a minute or two to evaporate any excess moisture from the dal. Serve amaranth leaves with toor dal over plain steamed rice and dollop of ghee. Suggestions: If toor dal is not cooked properly, add few splashes of water to the pan and cook covered till done. Variations: You can also boil the amaranth leaves in enough water and strain them before adding to the pan. Other Names: Amaranth Leaves with Toor Dal, Thotakura Kandi Pappu Podi Pappu. Amaranth leaves are washed and chopped. They are then cooked with tomato along with whole spices and powdered spices. Serve amaranth leaves tomato curry with steamed rice or with roti. Makes: around 4 Servings of Amaranth Tomato Curry. Separate amaranth leaves and wash thoroughly under running water. Roughly chop the amaranth leaves. When mustard seeds start spluttering, add green chiles and garlic. Fry briefly, add the chopped amaranth leaves. Fry for few seconds, stir in chopped tomato, peas (if fresh) and salt. Cook till tomato softens and amaranth leaves are cooked and changes color. Stir in peas (if frozen), coriander powder, red chili powder and salt (if necessary). Cook on low flame for few minutes and till the curry comes together a bit. 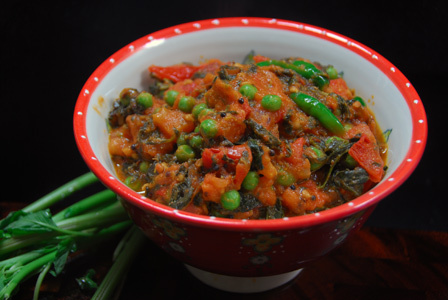 Serve amaranth leaves tomato curry with steamed rice or with roti. Notes: Make sure amaranth leaves are cooked well. Suggestions: If amaranth leaves are not cooked well, cook covered on low flame till done. Variations: Add a pinch of garam masala along with other spices if you wish. Other Names: Amaranth Tomato Curry, Thotakura Tomato Kura. Amaranth leaves and spinach leaves are ground into paste. Dosa batter is prepared with urad dal and rice flour and ground paste. The batter is made into somewhat thin dosa and is cooked till its light golden in color. 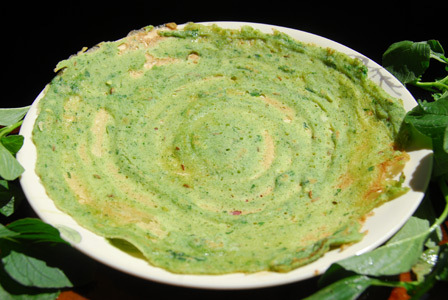 Serve amaranth spinach leaves dosa with coconut chutney or with any chutney of your choice. Makes: around 10 Amaranth Spinach Dosas. Wash, separate leaves and roughly chop amaranth leaves and spinach leaves. Bring to boil a cup of water. Add amaranth leaves and cook till amaranth leaves are soft. Stir in spinach leaves, green chiles and remove from heat. Once cool enough to handle, strain the leaves and reserve the cooking water. Grind the amaranth and spinach leaves into smooth paste adding reserved cooking water. 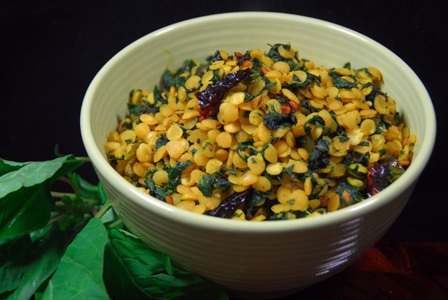 Remove the urad dal onto a mixing bowl, add rice flour, ground amaranth and spinach leaves paste, cumin seeds and salt. Mix everything with enough water for somewhat thin dosa batter. Leave the batter aside for couple of minutes. Pour a ladle full of amaranth spinach leaves dosa batter and spread with back of the ladle in circular motion into thin dosa. Turn the dosa on other side and cook for few seconds to crisp up a little. Carefully remove the dosa from heat and onto a plate. Repeat the same with remaining dosa batter. Also, store the dosa batter covered in a refrigerator for few more days. 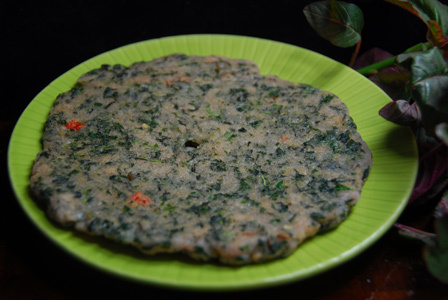 Serve amaranth spinach leaves dosa with coconut chutney or with any chutney of your choice. Notes: Make sure dosa batter is of right consistency. Suggestions: If dosa is coming too thick, add more water and try again. If dosa is breaking up or the batter is too thin, add little rice flour. Variations: Check other dosa recipes here. Other Names: Amaranth Spinach Dosa, Thotakura Palakura Dosa. Amaranth leaves are finely chopped and boiled in water. Rice flour is mixed with hot water into soft dough. The prepared amaranth leaves dough is spread on flat pan into thick rotti and fried till its golden brown on both sides. Serve amaranth leaves rotti with any pickle of your choice. Makes: around 2 Servings of Amaranth Leaves Rotti. Separate amaranth leaves and thoroughly wash them. Finely chop the amaranth leaves and keep aside. Bring to boil 3/4 cup of water, add chopped amaranth leaves. Boil till amaranth leaves wilt, add green chiles and salt. Remove from heat, immediately add cumin seeds and rice flour. Mix well to form a soft dough and divide into two portions. Heat a flat pan on medium low heat, add few drops of oil. Place the rice flour dough on pan and spread it with fingers into thick rotti. Cook covered on low flame till roti changes color. Uncover, turn the rotti on other side and cook for a minute or two. Repeat the same with the remaining portion of the dough. Serve amaranth leaves rotti with any pickle of your choice. Notes: Make sure to cook the amaranth leaves rotti well. Suggestions: Adjust the rice flour if the dough becomes too wet. Variations: Check other similar recipe rice flour chana dal rotti here. Other Names: Amaranth Leaves Rotti, Thotakura Tapala Rotti. Makes: around 4 Servings of Amaranth Leaves in Yogurt. Separate leaves, wash and finely chop amaranth leaves. Remove stems, wash, slice the green chiles. When dal changes color, add garlic and green chiles..
Fry briefly and add onion. Once onion turns golden brown, add chopped amaranth leaves. Add salt and cook covered on low flame for few minutes. Once amaranth leaves wilt and turn soft, add turmeric powder and remove from heat. Cool the mixture to room temperature and add to yogurt bowl. 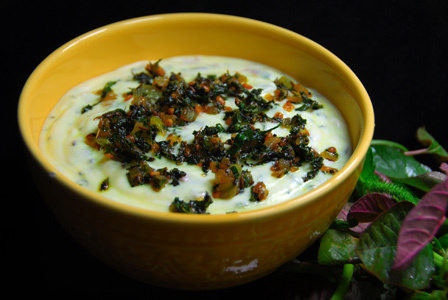 Stir well and serve amaranth leaves in yogurt with steamed rice or with chapati. Suggestions: If amaranth leaves are not cooked well, put it back on heat, add a splash of water if required and cook covered till done. Variations: You can also grind the amaranth leaves instead of finely chopping them. Other Names: Amaranth Leaves in Yogurt, Thotakura Perugu Pachadi.